The flash provides external light for taking professional-looking photos. When shooting in M-mode, set the flash output and press the camera shutter button, the flash will be under the synchronous signal of the camera. Note: when raise or lower power, if test button flicker up, please press it for test and then get the correct power output. S1 and S2 modes are applicable to slave flash to generate many lighting effects, they use the built-in flash or the top external flash as the master flash, and the flash is placed in various directions. S1 mode is valid for manual lightning environment.S2 mode is the applicable TTL flash for the environment. The flash will not flash synchronously with the first flash, but the second flash from the master flash. 12-month Limited Warranty. Backed with 90-Day 100% Satisfaction Guarantee. If you're not happy with your flash for any reason, please contact us and we will take the product back for a full refund. 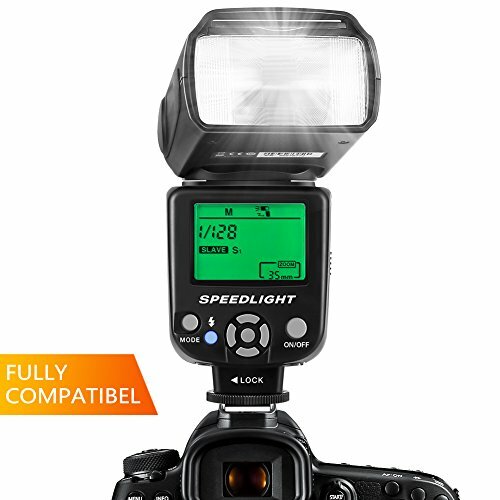 Great Flash Speedlite: Compatible with most DSLR cameras with standard hot shoe, supports manual/S1/S2 flash mode. Note: Don't support TTL and the camera menu setting Function. Rotation Angle: Vertical rotation angle: -7~90 degrees, horizontal rotation angle: 0~270 degrees, fixed zoom, provide you with a rich flash perspective. BONUS: Features a built-in flip down wide angle flash diffuser and reflection panel. Flash Control: 8 levels of output control to control the exposure manually. Press keypad to raise and lower power: 1/128,1/64,1/32,1/16,1/8,1/4,1/2,1/1, Powerful Flash with High Guide No.35 (ISO 100, 35mm) . Additional Function: power saving mode, over temperature protection and automatic saving function retains current flash settings. What You Get: 1 x ESDDI PLF-350 Speedlite Flash, 1 x Mini Stand, 1 x Separate Hard Flash Diffuser, 1 x Protection Pouch, 1 x User Manual. 100% Money Back Guarantee Or Ship You A Replacement in case you are not satisfied. If you have any questions about this product by ESDDI, contact us by completing and submitting the form below. If you are looking for a specif part number, please include it with your message.